The figures are staggering. Motorbikes of 200 brake horse power hitting close to 200mph (320kph) whilst lapping a highly challenging 37 mile course. What can be more exciting than that? I defy you to watch the video above on full screen without your hair standing on end! Also read “What Makes it the Greatest Motorcycle Race Ever!” for a broader view of the event. The IOM is synonymous with the world famous TT races that occur every year in early June. It is probably the most famous motorcycle race in the world with a history that runs for more than one hundred years. The first TT race was held in 1907 with the only breaks occurring during the two world wars. The huge influx of visitors, the population doubles during the TT, results in a real festival atmosphere that make this a must-do item for all keen motorcyclists and fans. The huge numbers attending means there is also much more going on than the races themselves. There are events on all non race days and a very lively atmosphere at night. 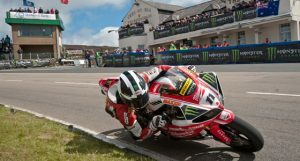 I have put together a brief guide to what happens in the IOM during TT race week by summarising key information and providing links to other good sources. Sunday 5th June: “Mad Sunday” – Members of the public do laps of the famous course (hence the name). Normal traffic is on the roads so bikers are supposed to keep to speed limits but clearly many do not. Care is needed around the roads on this day. Tuesday 7th June: Ramsay sprints – a day of sprint races along the promenade in Ramsey, here you can see some wacky and crazy machines! The Ramsey Sprint is a drag sprint over an 1/8th mile strip. Anyone who is willing to pay the entry fee can compete. Motorcycles from all over the world enter and some bikes have special modifications, which makes things very interesting. This is an all day event with food, exhibits and entertainment. Thursday 9th June: Laxey Bike Show – a chance for a wide range of exhibitors to show off their bikes. It is essentially a motorcycle show run by bikers, for bikers, and of course those interested in the diverse nature of motorcycling on the Isle of Man. The organisers have gone to great lengths to ensure that the show is not just a pass through event and have organised a ‘live music’ event on the green, and this has been complimented by a local Laxey Heritage Trust display. The 2016 entertainment calendar has not been published yet but to give you an idea of what to expect look at the 2015 Entertainment Schedule . I will republish this write up with a link to the new guide when it is available. Entertainment includes such things as Bushy’s beer tent and a funfair both in Loch Promenade Douglas, numerous motorcycle related exhibits and further action in the form of Stock Car racing in Onchan and, usually, the TT mayhem touring stunt show. There is live music on most evenings and air displays on several days. Your best bet is to review the entertainment calendar to get the full picture. There are also various tours available here during TT fortnight and these range from a VIP package which includes a closed road lap of the course, in a course car, through to a coach tour with a previous champion. It is worth booking ahead if you want to do any of these. There are a number of fanzones which have to be paid for but provide grandstand seating and have toilet facilities. There is a very good public transport network on the IOM with, both, train and bus services. Buses: The Isle of Man has an extensive bus network – Bus Vannin – which serves the whole of the Island on a regular basis including Ronaldsway Airport and the Sea Terminal in Douglas. Useful TT Information – The bus service goes around the TT course from Douglas to Ramsey when the road are open, there is no access once roads are closed. No bus service travels on the mountain section from Ramsey to Douglas, but this can be accessed via the mountain railway. The tour above includes a 4 day tour of Scotland on hired bikes. We can reduce the tour to just include the IOM TT if you wish. This is really a very nice piece. What do i need to do if i have to book this. I am really excited and keen. There is also a link at the bottom of the post to this. Bear in mind getting to the IOM for the TT needs organising a year ahead of the event due to the demand for travel and accommodation. If you would like to go I would urge you to act quickly. Wanna visit one day in future to see the race live. Hi Harsha, Thanks for your comment. I have tried to keep the main write up brief but as you can see I have linked in a lot of other information so you can expand your reading. I hope you get to make the journey before too long. I think if you are quick there are places left for this year.